So, I just heard his “Slingshot” piece from This American Life (you can listen here), and if you want that entire earlier paragraph in concentrate form (minus Coulton), well, that’s that. You’re welcome. 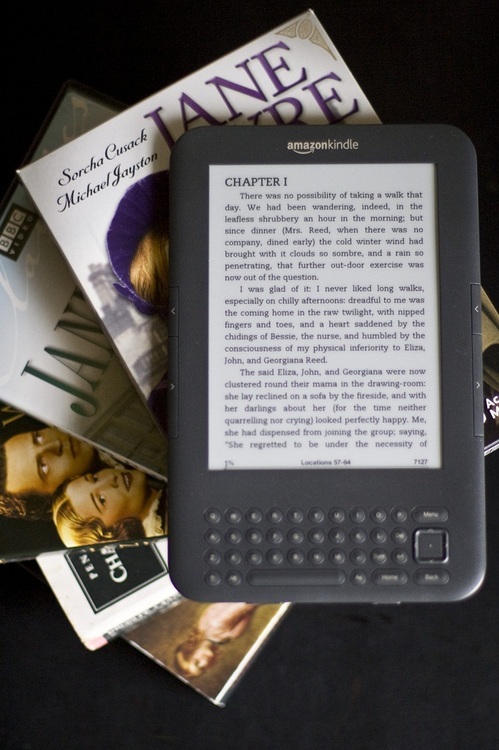 In other news, I just logged onto my library’s web site, clicked a button and had 1Q84 beamed to my Kindle for 21 days, for free. How cool is that? And I should probably mention here that KCLS also has the More Information audiobook for digital download, too. Which, you know. Just do it already. I want to look forward to The Great Gatsby and all, but then I remember Baz Luhrmann is directing and, honestly, the giant animatronic T.J. Eckleburg tromping through the barren landscape of Long Island shooting lasers from his eyes just wasn’t my favorite part of the book. Last March, I got a message from my friend Cookie asking if I knew anyone who would be available for a freelance photo gig, taking pictures for her next book. Cookie’s something of a rock star, so I briefly thought about doing it myself (who wouldn’t want to work with a rock star? 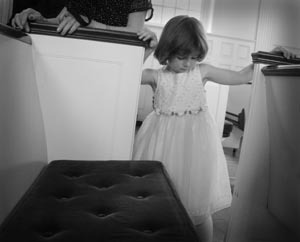 ), but the instant I saw the “mood board” she’d prepared to convey the look she wanted, I instantly realized I knew the perfect photographer for the job. It was a little heartbreaking, but I knew I didn’t really have the resources or, honestly, the talent to do better. 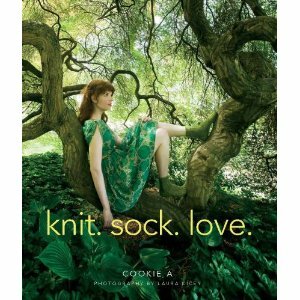 Sock designer extraordinaire Cookie A chronicles her love affair with sock knitting and explores different methods to pattern socks by examining their underlying structure. Nineteen patterns ranging from simply chic to astonishingly intricate are arranged into three sections: Columns, Tessellations and Diagonals. 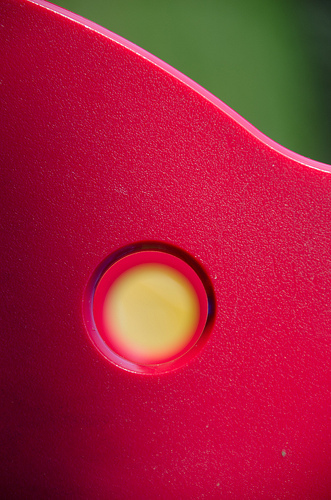 […] These rich and seemingly complex patterns are broken down step by step into bite-size components that are easy to digest. Illustrations, diagrams and charts accompany each project, offering an invaluable guide for visual knitters. Breathtaking photographs by Laura Kicey and styling by Sarah Beaver showcase the socks in dramatic locations, leading you off the beaten path just like the socks in this collection. This revolutionary compilation is sure to elevate sock knitting to new levels of sophistication. I’m already in love with the cover. If you know of either of them, well, this should be a no-brainer. If you know both, well, you probably checked out even before getting to this paragraph. I’m feeling a little maternal about this book because of my role as matchmaker, and I haven’t even seen a copy in the flesh, but I think I can stay pretty objective and say it’s probably going to be one of the best things ever, in the history of the universe. Or something. That was objective, right? As if there should have been any doubt. At all. To my UPS driver: three hours later doesn’t get you a kiss, mister — but I’ll still admit I squealed a little when I heard your footsteps outside. This seems like a fine time to share one of my favorite webcomics, with an appropriate strip: Kate Beaton’s Hark, a vagrant! Remember that scene in Beauty and the Beast where the Beast surprises Belle with a gift of… well, an entire library? I was seventeen when that movie was released, but I already knew it was the most romantic thing I could ever think of. I don’t even know when it was I first imagined having a library of my very own, but I must have been very, very young. About a year ago, I bought five IKEA bookshelves, with extensions, to install in the den — which was pretty much the first thing I did after acquiring said den. At the time, I think we talked about sharing pictures of our respective libraries. Problem was, I barely had any books at the time. I’d bought into a promise of a library rather than having one already. 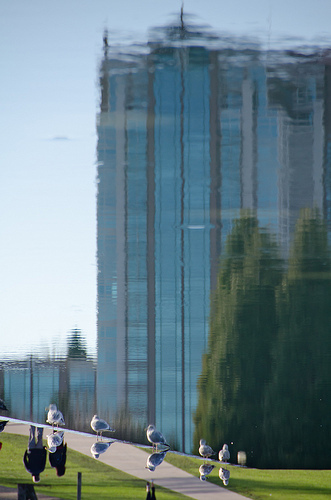 That’s the highest resolution I was able to get into one picture. Hopefully some of the titles are readable. There are a lot of childhood / teen relics here, so this is slightly embarrassing. I already made sure anything involving, say, Francine Pascal or Ann M. Martin were culled before the package was even sent, but there’s still at least an entire shelf of embarrassing science fiction / fantasy I haven’t weeded out yet (hint: they tend to be grouped together). Also at least five shelves of actual children’s books that I just can’t get rid of. At least not yet! 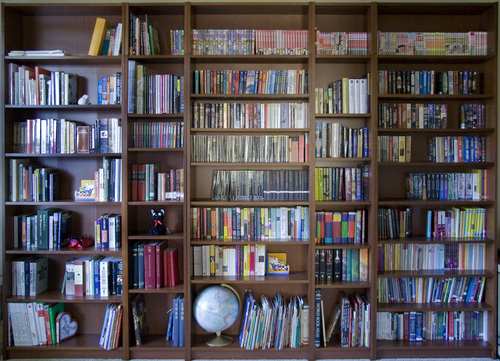 So… now that that’s there for everyone to see, what’s on your bookshelf? I want to see! Feeling better now. Baby steps. From Eureka, another version of the Fat Kreme Burger out in the wild. Vince recommended Richard K. Morgan’s Altered Carbon to me, knowing my love of classic John Varley stories and film noir, and it was a fun read. Morgan has the tone of far-future noir down pat, with an intelligently speculative setting and lots of hard-boiled action. If you enjoy the typical noir antihero — aggressive, haunted, misogynistic — then Takeshi Kovacs should be right up your alley; subversive, this is not. But the choking masculinity effectively evokes the ghosts of Mickey Spillane, of Hammet, of Chandler, and more recently, the graphic fiction of Frank Miller*. So! If you’re looking for that kind of literary fix, this may be right up your alley. Directly afterwards, started reading Hard-Boiled Wonderland and the End of the World, which in many bizarre ways is exactly the same book (well, at least as far as I’ve gotten in it). * speaking of which, how great is it that they’re finally releasing a real DVD of Double Indemnity? Seattle’s 25th consecutive day of rain was not an ideal time for my windshield wipers to break. Yuck. And apparently we’re closing in on a record with the rain thing, though you wouldn’t expect it. Is it possible for me to tell you that I’m getting addicted to board games without sounding like a total geek? Double yuck. My poor little laptop is worrying me with lots of loud clicking coming from the hard disk. Yuck!! But there are good things too: thank you to the lovely person who found my Amazon wishlist and sent me Hard-Boiled Wonderland and the End of the World. Also to the divine quartet who gifted Teavana’s tea-of-the-month club, which apparently began in earnest with a knock on the front door this morning. How great is that? Quiet birthday yesterday, spent mostly at work. Before that had an expensive present as was forced to replace one fireball-spouting garage dweller with something new and non-lethal. Today I’ve treated myself to Royall Tyler’s new-ish translation of The Tale of Genji and Robert Graves’ of Suetonius’ The Twelve Caesars, and I plan to celebrate with a cup of hot tung ting jade and a comfortable seat, and let the dragon sleep. Lunch this week’s been flavored with spoils from that day-off lunch trip to Salumi (hot sopressata — so yummy). Also, since I know you get all your potato chip-related news here (and you do, don’t lie), I feel I should let you know that Tim’s Cascade has a new, limited-edition* habañero flavor. The flavor is rich, not as bitter as the well-loved jalapeño, with a heat that sneaks in silently. Shared a bag with friends, and the previous consensus favorite (dill pickle) sat unopened and neglected. Seriously, they were that good! * I’ve no idea what this really means, as the wasabi-flavored variety, reported on in January, seems to remain readily available. I’ve got The Nag Hammadi Library out from KCLS for later (also see: The Gnosis Archive), though I think Paul Ford’s Gary Benchley, Rock Star must slot in next on my reading list. Also, goddess save us — before vince’s head explodes. Watched Mishima: A Life in Four Chapters from the disadvantaged viewpoint of someone who hasn’t yet read any of his work, and found myself kind of underwhelmed and ambivalent by it. 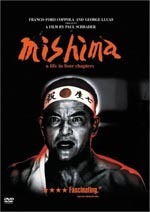 There’s something a little off about the overall direction and/or narrative, causing a story that should have been extremely compelling — the stranger-than-fiction life and death of Yukio Mishima — to never quite dig itself an emotional foothold, despite leading man Ken Ogata’s heroic efforts. This leads to a total sense of anticlimax in the fourth and final chapter, where the author’s explosive last hours seem rather pedestrian, as if the movie’s already decided the interesting part is over, just as most viewers will be expecting it to begin. In a sense, it’s correct. There’s real meat and beauty in the vibrant dramatizations of three novels (The Temple of the Golden Pavilion, Kyoko’s House and Runaway Horses) woven into the film’s first three chapters. Highly stylized and charged with color and energy, they paint a far more vivid picture of the man and his inner life than the factual sections do. I’ve no idea whether it’s an accurate one, but it really doesn’t matter as far as moviemaking goes: I adore the atmosphere of these segments, which seem to live in a visual world straight out of a ’50s-era Suzuki yakuza epic, and are perfectly married to Philip Glass’s score. It may not be biography, but it’s probably worth a rental for these alone. More importantly: now I really want to read the books brought to life in the movie, as well as the two I currently have checked out from the library (Spring Snow, which I’ve mentioned before, and the short story collection Acts of Worship, which I haven’t). I may well decide I hate them afterwards, but I guess it means the movie was effective after all. Hee. Okay, totally ignore this entry unless you want to know the secret location of the world’s yummiest Chinese baked pork buns. They’re so good — sweet, soft, filled with a perfect mix of roast pork and caramelized onions. I’ve been grabbing them greedily on my New York visits for years but until now never bothered to get the actual address down so that I could share with others. So! 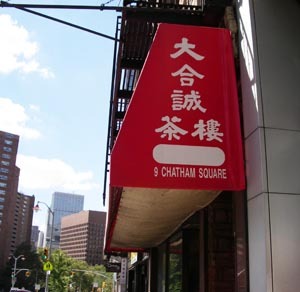 It’s Chatham Restaurant at 9 Chatham Square, which is Bowery near its intersection with Mott Street in Chinatown. You can’t miss it, it’s the big red awning near the Subway sub shop. Remember, they’re baked — not steamed — so we’re talking doughy rather than fluffy, but trust me on this. You won’t be sorry. The Hassassin smirked. He had been awake all night, but sleep was the last thing on his mind. Sleep was for the weak. He was a warrior like his ancestors before him, and his people never slept once a battle had begun. This battle had most definitely begun, and he had been given the honor of spilling first blood. The writing’s worse, but the story is somewhat better, at least until it all falls apart in the endgame. I enjoyed the fact that we’re finding our heroes looking for answers at an honest-to-goodness library when the doomsday clock is ticking — though it makes me long for an adventure book starring a librarian rather than a “professor of religious symbology,” whatever that means. I think I’m Dan Browned out for the rest of my life. Jessamyn told me over the weekend that Deception Point was actually a fun read, but it will have to wait. I need to read things where the words are beautiful, at least for awhile. Do you know anyone who talks like this all the time? Do you like to spend time with this person? There are whole pages of discussions of things like the golden ratio and fibonacci sequences that come off as masturbatory. Plot twists and puzzle solutions are condescendingly telegraphed with marquee lights pages ahead of time as if reaffirming the idea that Langdon (and by extension, Dan Brown) is just that much smarter than the reader. Still, I’ve no-one to blame but myself. Despite the silly plot and tone I still stayed up late and finished the whole thing, if only to witness unbelievable moments such as three supposed Da Vinci scholars staring at a “code” of clearly-reversed cursive lettering and not recognizing what was going on. That’s not all of it, however — I guess I’m a bit of a sheep after all. Summary? Let’s just say that it was about as entertaining as National Treasure with three times the time investment. It’s possible that I’m just feeling annoyed at a book that has yet to be released in paperback after two years in print. I doubt it, though. Thank goodness for the library — where I also picked up some Mishima as a palate cleanser. In other news, I’ve had that poppy cover of “Pure Imagination” (Willy Wonka and the Chocolate Factory) from the Mastercard commercial stuck in my head all evening, which kicked off a brief google search to find out how I might get ahold of it in a more on-demand format. Phooey on Wikipedia for making it so easy to find bad news. All right, so I’m easily dragged into these things. No, I will not be in some huge line at midnight like everyone else, nor will I be raw-eyed and happily reading into the wee hours of the morning. Being a completist and an authenticist* (read: snob), I pre-ordered the Canadian edition of Harry Potter and the Half-Blood Prince from Chapters — and since I only got the shipping notice today, probably won’t see it for another week. Oh, the anticipation! I’m almost used to it now, since this is the third time I’ve gone this route. 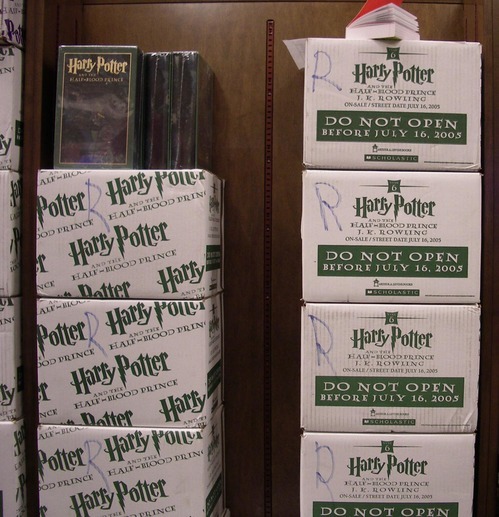 I remember actually attending a lineup for The Goblet of Fire at Barnes & Noble (they even had drink service! ), but really, that was only to keep my other Potter-mad friends company. The woman at checkout looked at me as if I’d grown three heads when I said I wasn’t there to buy. Anyways. One week! Assuming there’s no hang-up at customs. If you think I’m avoiding you in the next few days, please don’t be offended: it’s probably only because I’m afraid of spoilers! * no joke! I even bought the movie version of Harry Potter and the Philosopher’s Stone from Canada so that my books and discs would match! Have taken a turn for the better, somehow — health crisis averted for now. Still, no sense taking chances, so I spent today mostly sedentary, reading about cherries and felting wool and echidnas, also known as spiny anteaters, the only surviving relatives of the platypus (warning: hatching baby echidna photo). Also started The Diary of Lady Murasaki. I know it’s a horribly romanticized notion with little connection to reality, but I’ve always thought that if I’d had the chance to choose what era I could live in, that the life of a lady-in-waiting at the Heian court would be very appealing. But then, I’ve always felt (and have mentioned here before) a special affinity with Sei Shōnagon, planted at an early age. Oh, to have lived in an age of aesthetics! That’s the kind of decadence I can get behind. Being able to dress like Queen Amidala would be pure frosting. I think the charm of tooth-black would wear thin very quickly, though. Resolution #1: I’m going to try a lot harder to respond to your comments on neon epiphany, so please hold me to that. Miranda tagged me with the book meme. I guess turnabout is fair play, but I am super-lame about books so this will probably not be my most interesting entry ever. Total number of books I’ve owned: v. hard to tell, because I’ve had many collections and they very rarely accompany me when I move. And likewise the set of books I’ve owned and those I’ve read only partially overlap. I’ve always been good at reading books I borrow while neglecting those already on my shelf. That’s not really an answer, is it? So: I suppose I’ve got four bookshelves right now, in varying stages of fullness. Last book I bought: The Wind-Up Bird Chronicle by Haruki Murakami, used and tattered. I’m not sure where it goes on my to-read list. But soon. Last book I read: Mostly snippets, lately, concentrating on Murakami’s A Wild Sheep Chase, while flitting between Robert Bringhurst’s The Elements of Typographic Style (been reading this in inches for years now) and a couple books on gender studies: The Body Project: An Intimate History of American Girls and Sexual Metamorphosis. Last book I finished: A. S. Byatt’s Little Black Book of Stories. I’ve already talked about it here, so I won’t bore you again. Sei Shōnagon, The Pillow Book (abridged & translated by Ivan Morris, though the Amazon listing seems to be for a different edition — complete, perhaps? ): when I was thirteen I was in a summer program at the University of Chicago, my first major experience spending time away from home, and I absolutely fell in love with the Seminary Co-op Bookstore there. I’d never seen so many wonderful books in one place — not gaudy bestsellers but serious literature and non-fiction, both classic and obscure. I gravitated especially towards the east asian historical section, and swallowed them up — Sarashina Nikki, The Tale of Genji*, Romance of the Three Kingdoms — and Shōnagon was my favorite of all, a collection of moments of perfect beauty, many unburdened by narrative. I always wanted neon epiphany to be my own pillow book. I’m still trying. A. S. Byatt, Possession: A Romance: this was the first adult fiction novel I ever read, and the first trade paperback I ever bought, also at the Seminary Co-op. Though I’ll admit I bought it for the beautiful Rosetti used on its cover (having not yet encountered pre-Raphaelite art), Byatt managed to bring that same feeling to life in words and verse, and brought to life a kind of nineteenth-century mythology. I don’t know if it would still affect me so much today, and I haven’t dared re-read it for fear that it wouldn’t. John Varley, The Persistence of Vision: John Varley’s been on a novel-writing kick lately, but none of them shine as brightly as the jewels of short fiction he wrote during the ’70s & ’80s, most set in his “Eight Worlds” future history. I was still in my early teens when I found his “The Phantom of Kansas” in a paperback SF anthology, wonderfully readable and touching on themes of identity and gender, human cloning, environmental disaster, and the idea of art in the future. So I picked up Persistence, as well as The Barbie Murders and Blue Champagne, and read and re-read them. They’re all out of print now, but a good selection can be found in the just-published The John Varley Reader. Frank Miller, et al., The Dark Knight Returns: showed me that comics could be serious, dark and adult in every sense of the word. Can I tell you how much I loved Sin City? I won’t, though — movies are a different topic completely, and I’d talk your ear off. Had a hard time deciding between this and Miyazaki’s Nausicaä of the Valley of Wind, which I came to almost simultaneously and had no less effect on me. Margaret Atwood, The Handmaid’s Tale: I had the best high school junior english class, ever — we read LeGuin, Mary Shelley, Joseph Conrad, Thomas Harris, and even watched Koyaanisqatsi. It’s been so long that I don’t remember the details of the story, only the lingering feeling of terror and helplessness at a society so totally out of balance. My only comfort was that I could think of it as caricature, but should re-read it, now, when our own world seems to be spinning uncomfortably off-kilter. Honorable mention: Tanith Lee’s The Book of the Damned. That’s what I really want to write. Five people I want to see do this: Wow, almost everyone’s already done this one. Hmm. How about janjan, Alice, fer, pixel and George? *oh dear — it looks very much like I’m going to have to get ahold of The Diary of Lady Murasaki. A wall of rain and fire to the west means I’m still stuck in New York for now — well, not stuck in New York, exactly, which would be just fine, but in the limbo that is the airport. Airports are places you’re either going-to or coming-from. There’s no such thing as being at an airport. The air is muggy and oppressive. Sitting in a wet-hot plane for three hours on the runway, or in the wet-hot terminal, neither much of a choice — nor is spending the night at La Guardia or O’Hare. At this point I just want to feel Seattle’s cool embrace and the warmth of home. Leftovers and reruns and chores and sleep. I’d even like to be at work again. In the meantime I’ve plenty of reading to chew through. Just finished A. S. Byatt’s Little Black Book of Stories, some of which left me cold but “A Stone Woman” and “The Pink Ribbon” were both affecting. The weaker stories suffer from truncation, or too much cleverness; all beautifully-written, of course. I’d forgotten how she dances in description, her joy in lists and catalogues. Also, have started A Wild Sheep Chase, which will hopefully last me until I’ve no more need of words. I might have read three books in the whole of 2004, and twice that just in the past month. It’s like slipping into a favorite pair of shoes, familiar and well-worn. Update, Tuesday a.m. — in Chicago. They say we can leave within the hour. Fingers crossed. Update, Tuesday p.m. — home! !